He said LU "were getting into the spirit of things by decking the place out in balloons and having some staff dressed in period costume handing out centenary choclate coins to the customers - it was really sweet and I saw loads of people with a smile as they entered the depths of the Northern Line - itself a rare sight! I grabbed a pic of two of the supervisors in their finery". And very nice cheerful looking chappies they are. Thanks to Gareth for sending them in. Did you see celebrations at any of the other stations? It looks as though there were some older trains put on from the terminal at Mill Hill East, although this wasn't mentioned on the TfL's site (however, a new station called Morning Crescent did seem to be celebrating!). 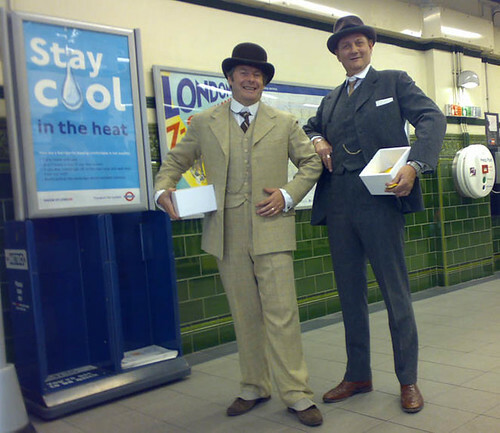 When the line was extended northwards and southward in the mid 1920's it became known as the Morden–Edgware Line, although a number of alternative names were suggested such as “Edgmorden” and “Medgware”. Unfortunately neither were taken up and the Line was eventually named the Northern Line in 1937. It's sad there's only the Bakerloo line that has this amalgamation of names. 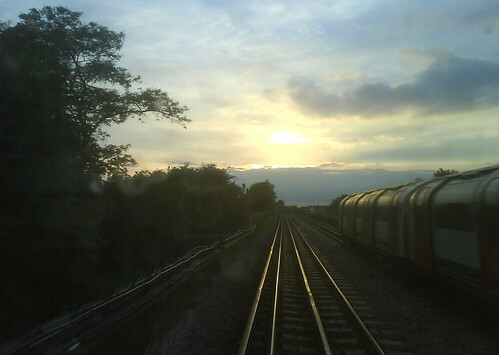 Personally, I wish the Piccadilly line was called the Cockerdilly line. 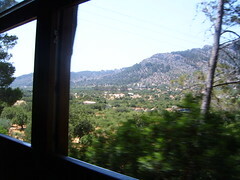 But it was simply nice being in a train in the sunshine with amazing views. 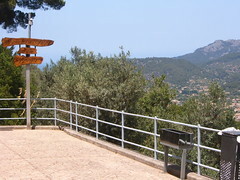 Where potentially you can reach out to grab lemons from the trees (although you'd probably break your arm in the process). London with all the rain on the lines seemed a million miles away. 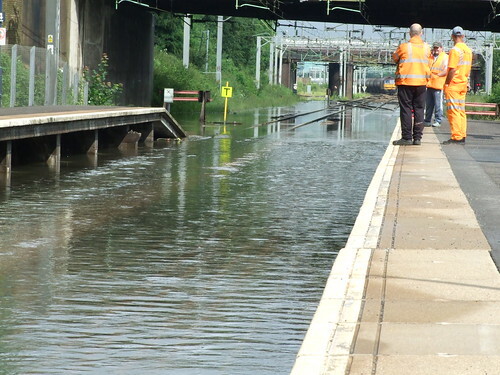 Did we have any lines or stations closed due to the wrong time of rain when I was gone? Monkeyboy 69 has sent me in the direction of Sparkes68's photos of a flooded line at Tame Bridge, just so I can see what I missed. 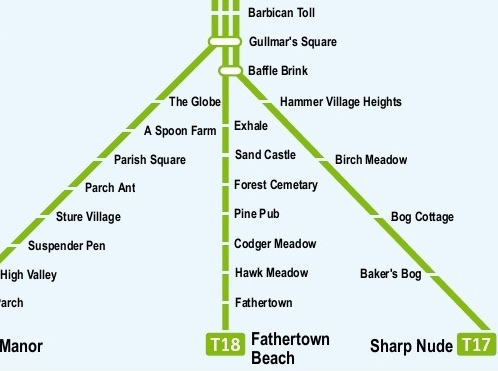 "A lot of people take the Underground map and play about with the names. 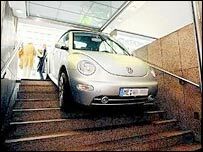 Anyone can do it (unless the TfL copyright lawyers get them), and awarding a Turner Prize for this seems to be going a bit far to me. Quite a lot of people have got in touch with me, who like me are not happy with the current Underground map design, too many zig-zagging kinks rather than the elegant straight lines of times long ago. 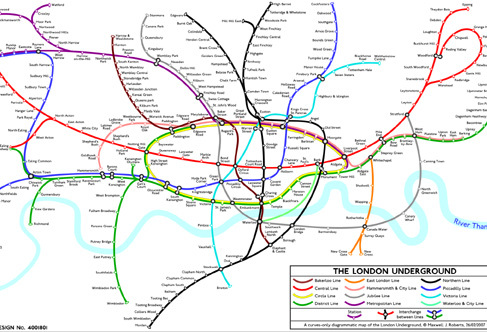 Several people have had a go at redoing the Underground map themselves to get rid of the worst of them, and generally they seem to do a better job than the 'experts' at TfL. Myself, I have been wondering whether Henry Beck's rules are past their sell-by date (he was wondering this himself towards the end of his life). Once a metro system gets complicated, it's virtually impossible to show it well by using them, so I've been having a go at throwing the rules in the dustbin instead. The all-curves map is completely new, you won't have seen it before. 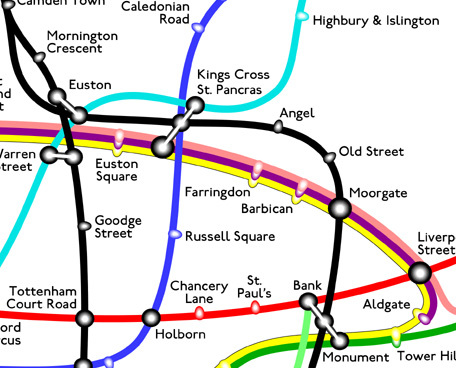 (I'd seen Max's previous map at a London Underground Railway Society lecture) I've got rid of the kinks by having smooth gentle curves all the way, in theory easier for the eye to follow because a lot of the jerkiness has gone. I would be interested in people's responses to this map. A lot of people (not particularly map geeks) say that it is inviting and fun to look at." I like it, although it does remind me of a wasp or some strange insect with a long proboscis forming the eastern end of the Central Line. If you can get out of the habit of seeing Beck's as the norm, although it's a bit disturbing at first, I think the kinkless ones make more sense. But as Max says he'd be interested in hearing your thoughts and if you want to see the whole map click from here. Wobbly headed pregnant Dawn from EastEnders fled Mad Doctor May and Drippy Rob after being abducted by them and threatened with an early Caesarean conducted by the psycho pill-popping GP. Where did she head to get away from it all? Walford East Tube station and the delights of the District Line. I was particularly proud of her giving a mouthful to the guy sitting in the reserved seat "Oi can't you read", she said thrusting her bump in his face. No subtle "Baby on Board" badges for Dawn. After plonking herself down, we learnt that her baby was going to be called "Summer", but due to a plot device, sorry incident, at Tower Hill, I think she'd be better off re-thinking the child's name. Stepney or Debden has a nice ring to it. Or how about Toyah Upney Beyonce Emily? The familar closing drum beat was preceded by Dawn wailing "Me waters have broke" and the camera panning down to a seat you certainly wouldn't want to sit on after she'd left. You can watch the highlights of the episode here. Sadly, I'll miss Thursday's episode and will have to watch catch-up TV. But will this be the Tube's second carriage birth? Surely some more kids been born on Tube carriages since Mary Ashfield Eleanor Hammond (rumoured to be named Thelma Ursula Beatrice Eleanor) in 1924? 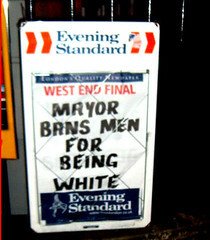 You can say what you like about Mayor Ken (and there's plently to say at the moment), but he certainly practices what he preaches as far as travelling by London Underground is concerned. He was spotted taking the Tube at Finchley Road on Saturday when according to spottee Toby Bryans, half of the system wasn't working. Toby was off to Wembley Park and said "Whilst I was waiting, a certain Mayor turned up on the platform and boarded a north-bound Jubilee Line train. I have always heard tales that he still uses the Tube and it was great to see them confirmed even on a day when half the network was down." The challenge looks as though it's going to be for someone to spot him on the Tube without his raincoat. I'd also love to see him reading the Standard, particularly on a Ken bashing day like yesterday! It's Friday's look at Tube Fashion Victims, TFV's or commuters spotted on the Underground where the fashion police have had a day off or commuters have taken a style and made it their own. I can't believe that this woman was seriously wearing a dress like this unless she was at an exhibition. On the occasions when I'm at exhibitions (I'm actually at the NEC today), I'm lucky that I don't have to wear a "uniform" apart from a T-shirt with the company's branding on it. But if I did have to wear a uniform I wouldn't wear it home. Her bag looks big enough for her to have been able to carry a change of clothes. 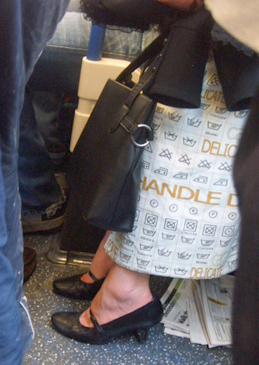 So perhaps she does get a kick out of wearing a dress with massive washing instructions on it. The mind boggles. 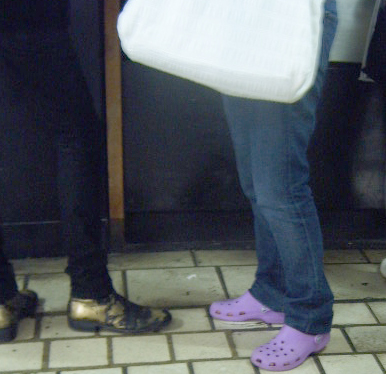 I loved this couple's footwear. He was going for the wannabe rock star look with gold snakeskin or even crocodile skin look boots. She was at the other end of the scale with some purple Crocs. I was in Guildford last weekend and saw someone trying on a silver pair of Crocs. Is the trick with Crocs to buy the most brightly coloured ones you can? 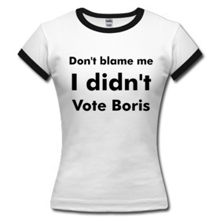 Do they even come in colours which aren't dayglo or scream (and with apologies to Kath & Kim) "look at me, look at me"? Now to finish with two terrific guest spots. 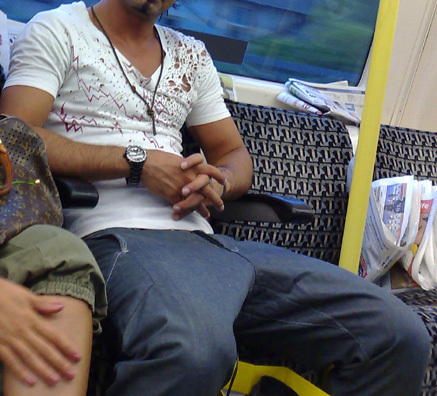 He said "Saw this guy on the Northern Line - and it was obvious what had to be done - snap him and send it to you!". If you click onto John's flickr profile you'll see that TFV3 is really posing for the camera as well. He's clearly in serious need of some moth balls for his wardrobe. Finally someone who hasn't quite got the Green Goddess look right. 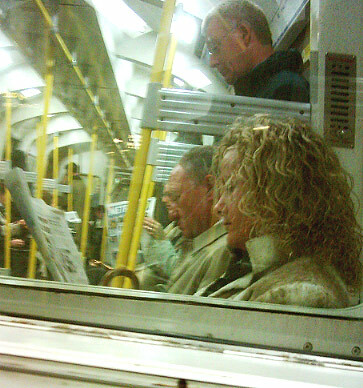 Snapped by Fabien who said "I saw a Teletubby on the Tube last week at Blackhorse Road. Didn't know the Victoria line went to Teletubby Land." I love the look of horror on the guy staring back at her. Fortunately it's not often that I get to say that some Tube trains nearly crashed but it's slightly typical that it happened on the beleagured Misery Line. 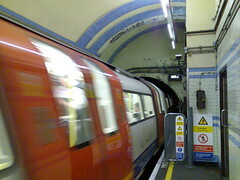 An investigation is under way after a Northern line Tube train entered a tunnel the wrong way, into the path of another train on Sunday. The train's driver slammed on the brakes when approaching Camden Town station as he saw the other train. A London Underground spokesperson said "Incidents of this nature, whilst disturbing to the public, (no sh*t Sherlock) are incredibly rare." I think he or she is right as in all of years of blogging, I don't remember hearing about a train going into tunnel the wrong way. But perhaps these incidents are hushed up. Thanks to Owen for giving me the heads up on the BBC report. 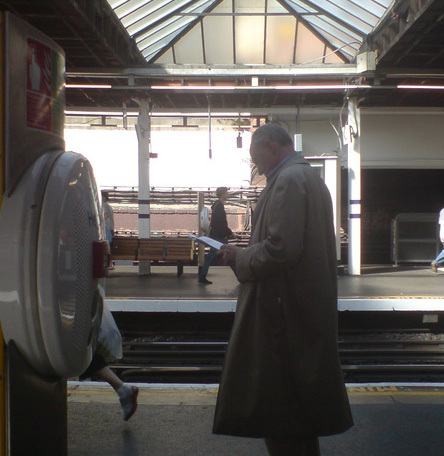 It was announced today that from March 2008 around 40 of the most lightly-used ticket offices at Tube stations will close and other stations will see a reduction in ticket office opening hours. It's all down to the "success" of Oystercards. 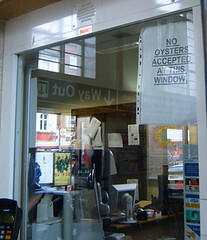 Richard Parry, London Underground's director of strategy and service development, said: "The success of Oyster has led to a huge reduction in the number of customers buying tickets at our stations. This has meant that we have already been able to shift station staff from behind the plate glass windows in ticket offices to the platforms and in ticket halls. By increasing the visibility of staff they will make the stations a safer place and will be able to fully assist customers." 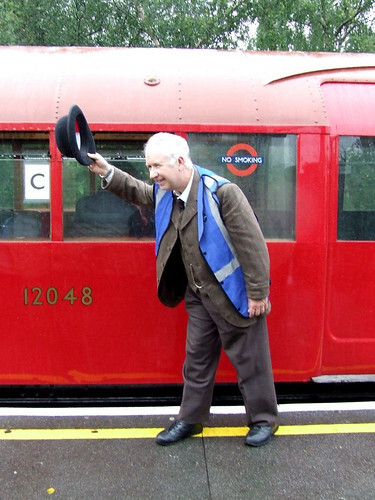 Parry added: "We have also embarked on the biggest programme of investment, renewal and increase in capacity on the Tube since the Second World War. To cope with this extra capacity staff will also be re-deployed to drive these extra trains." 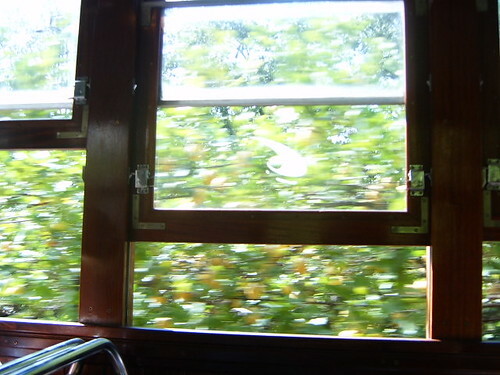 So it looks like some of the faces you saw behind the plate glass will be seen behind the controls of trains. I'm only a fairly recent Oystercard user (well since September) and I still see TONS of people with paper tickets. Apparently Oystercards are used for 60% of all Tube trips. Some of these "lightly used" ticket offices may I suppose make sense. See Transport Briefing's penultimate paragraph for the hit list. Maybe your regular station's office is there. Of the ones I use Ravenscourt Park & Chiswick Park are pretty much devoid of staff at the best of times, so losing the ticket office might not make difference there. But what about Regent's Park? I'd hardly say that was a lightly used station and is full of tourists. They're very unlikely to know about or even want to use an Oystercard. Who's going to help them when they're mooching around the station looking to buy a ticket? Keith Norman from Aslef isn't convinced about the extra staff being easily on hand and said "This raises clear safety issues. 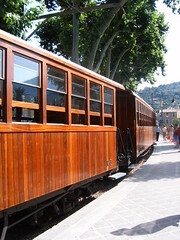 The ticket office would be the first point of call for passengers needing help." So what do you think? Will you miss seeing your friendly ticket office person? Won't they be expected to earn more if they're driving trains? What happens when something goes wrong with the ticket machines? What happens when the Oystercard reader doesn't work? 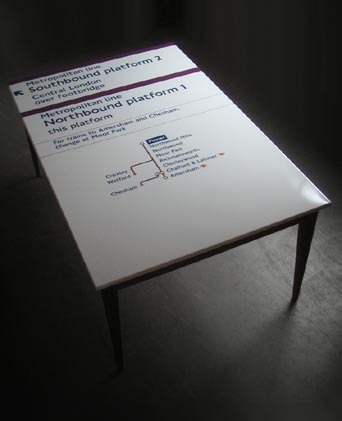 If your Dad's sick of socks, ties and aftershave and you happen to have just over a grand to spend, why not get him this Metropolitan Line table? It's made from a "reclaimed" enamel sign. It's a snip at £1250 +VAT and he can rest assured in the knowledge that they are limited edition. Well limited until some other bright sparks have a similar idea for reclaiming parts of the Tube to make into furniture. Cheers to Rob for the heads up on that. 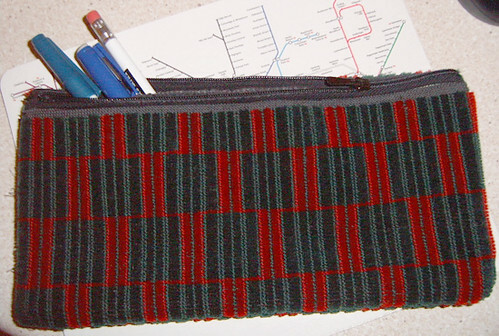 BTW IanD are you still selling those pencil cases and draught excluders that your Mum made from old Tube seat upholstery? My draught excluder has turned into a handy door-stop at the moment as my house actually wasn't particularly draughty this year. Alternatively if your dad's into gardening, you can make some flower pots out of reclaimed Metros. Any other ideas for Father's Day gifts with a Tube theme would be more than welcome. I don't go south of the river"
"what do you stars say today love? To get closer to you? I'd find love on the Northern Line"
Theirs closes with more turn of the century boy band warbling / white rap "Nah, nah, nah, Northern Line, bring it on, bring it on, Bring it on Baby. Northern Line one time etc etc"
But both end with a sort of Tube noise reference. Schmoof's lulls you with the gentle rocking of "Northern Line, Northern Line, Northern Line," repeated to fade. Ziggy's ends with a static crackle caused by a woman in a white coat unplugging a lead from a giant computer. Possibly the power socket which runs the entire Misery Line. And speaking of love on the Tube, Adam Gichie from TV production company Drive Through Pictures, is researching for a program based on finding love on the underground. He's looking for some real life stories, "everything from funny flirt stories to fully-fledged dating success stories." Please email him - adam.gichie@drivethrupictures.com if you've got anything that fits the bill. Certainly beats the view of train drivers on the Victoria Line. I wonder if they get paid more or did they just draw the short straw if there's a Tube drivers line lottery? 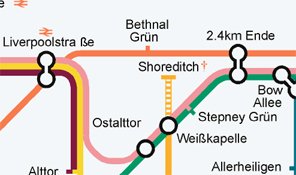 Some of you might be familiar with the "If Germany had won the war" Tube map, which takes the London Underground Map and translates station names to German. Mile End becomes 2.4Km Ende, Elephant and Castle, becomes Elephant und Schloss and sadly Piccadilly Circus, remains Piccadilly Circus. Surely there was an opportunity to make it Piccadilly Zirkus. As the map was sent to the blog by a Dane, they may not have been totally fair with some of the translations as the blogger at Strangemaps says "As is well known, Danes will grasp every opportunity to ridicule their Swedish neighbours". So if you can speak Swedish and think you've got a raw deal, please get in touch to correct. Cheers to Jon for the heads-up on this. 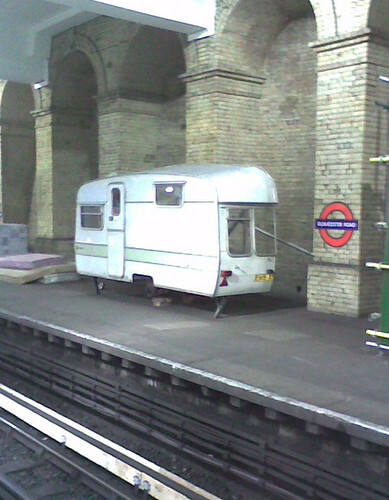 Thanks to Michael W who sent me a picture of half a caravan and some mattresses at Gloucester Road Station. If it wasn't at Gloucester Road you'd be forgiven for thinking there were some very weird campers or that the German woman who mistook the subway for an underground car-park had made her way over to London. We're not so lucky. Gloucester Road is one of Platform for Art's showcase stations and the caravan and mattresses are art installations. As it's quite a recent installation, currently there doesn't appear to be any information about the artist or the statement that the installation is making. As Michael said, it's all a bit Tracey Emin with her un-made bed and tent. Way too derivitive in my opinion. Or maybe that's the point. 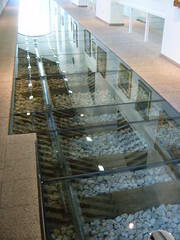 Perhaps we're being asked to question Emin's art. Maybe it's a playful pun on the signifcance of travellers exchanging a commuter lifestyle for one that's more free and innocent. In any case, I wonder how many enterprising homeless folk will try to nab the mattresses during the installation's run? 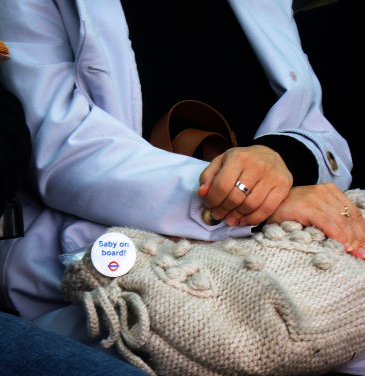 Yesterday for the first time I saw someone wearing a "Baby on Board" badge on the Tube. I say wearing - she actually had it pinned to her bag which wasn't neccessarily the most prominent place to display it. This initative has been around for a number of years now and is supposed to help pregnant women get a seat on the Tube. According to London Underground: "Research shows that Londoners agree that pregnant women should be offered a seat but also reveals that men are afraid to act on their chivalrous instincts in case they give offence." Personally I think that's a sad statement. Firstly, why should only men be expected to give up their seats? Also shouldn't we be happier being "chivalrous" rather than worrying about someone fat thinking that we thought they were pregnant? * 78% of currently pregnant women stated that they never ask for a seat when they need one. Crikey, if I was pregnant I'd be sticking my child to be in people's faces on the Tube at every opportunity. But that's just me. Also if a bloke's kind enough to offer me a seat I take it. What are your thoughts on seat offering in general?